1 Commercial Real Estate & Properties in Wolli Creek are listed in 1 categories. We have 1 Industrial Warehouses Lease . 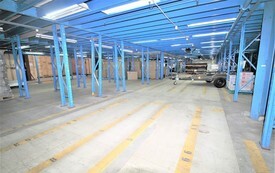 Gunning Real Estate is pleased to present these storage spaces for lease. Conveniently located in the Wolli Creek/Arncliffe industrial precinct, the property is in close proximity to M5 on/off ramp, Princes Hwy, Port Botany, and the City. The lettable areas are flexible depending on the tenants' requirements. KEY FEATURES: Area from 100sqm to 915sqm Roller door access (4.5m height) Loading dock in place Easy truck and container access 2.4m to 2.6m clearance Flexible lease arrangement Please contact William Wu (0450 250 123) for details or inspection. All figures above are approximate.